6th December 2018 beloved husband of Kathleen, loving father of Robert, Marie, Ann, Danny, Michelle and Paddy, a much loved grandfather and dear brother of Lizzie, Susan, Bridget, Bernadette and the late Ellen, Jimmy, Maggie, Pat, Mattie, Mary and John-Gerard. Funeral from his home, 221 Baranailt Road, Limavady tomorrow (Saturday) at 11.20 am for 12 o’clock Requiem Mass in St Finlough’s Church, Ballykelly. Interment afterwards in the adjoining cemetery. Family flowers only please. 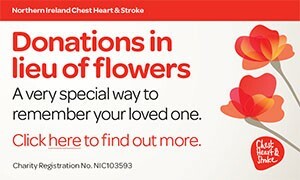 Donations in lieu of flowers if wished to Friends of Altnagelvin (Ward 1), Altnagelvin Hospital Trust Headquarters, Glenshane Road, Derry, BT47 5YN. I am sorry to tell you that Robert (Bobby) O'CONNOR has passed away.